(Daphnia spp., approx. 0.25 - 3.0 mm/0.002 inches) Water fleas are found in almost all freshwater habitats. They feed on algae, microsopic one-celled animals (protozoa), bacteria, and organic detritus (debris). Eaten a lot by small fish, water fleas are an important element in aquatic food chains. They collect food by moving their legs to create currents to carry the food to their mouths. 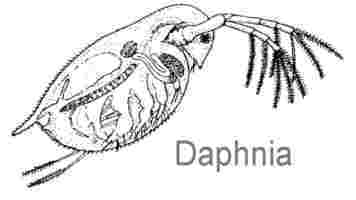 Although there are several species of water fleas, the Daphnia genus are commonly identified and used in lake studies. (Adult (body), 2.5- 3.0 inches; Nymph, 1.0-2.5 inches) Immature dragonflies tend to be brownish-grey and are often covered with algae. These characteristics help them blend with their surroundings as they cling to plants or wait in the mud to catch prey. Nymphs have a diverse diet including mollusks, insects, worms, and even small fish. Adult dragonflies, with their excellent eyesight and flight abilities, are also good predators. Birds and frogs often prey on dragonflies. (Adult (body), 1.0-1.8 inches; Nymph, 0.8 inches) Like dragonflies, the damselfly nymphs tend to blend into their surroundings and are often covered in algae. Using their strong jaws, the nymphs eat a variety of foods, ranging from mollusks, insects, crustaceans, worms and sometimes small fish. Unlike dragonfly nymphs, the damselfly nymphs has three leaflike gills at the end of its abdomen which it uses to get oxygen. 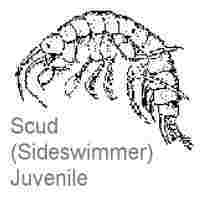 (Larvae, 0.2-0.8 inches) Scuds are small crustaceans that can be found at the bottom of lakes, ponds, and streams. They typically swim on their sides through the mud and bottom vegetation. Scuds are considered scavengers or omnivores, feeding primarily on plant and some animal debris. Scuds are an important part of the aquatic food web, both as scavengers (i.e., eating dead or decaying matter) and a source of food for fish which eat off the bottom or among plants. (Adult, 0.5 inches; Larvae, 0.6-1.5 inches) Caddisfly larvae are soft-bodied – some species are free-living while others make a case out of plant matter, sand, pebbles, twigs, grass, etc. Different caddisfly larvae species have different feeding habits. Some eat mostly moss, algae, and dead leaves but some are also known to eat small dead animals. Others eat small living animals, insects, and plants. Adult caddisflies look like moths, are active at night, and have long antennae and large wings. They adults eat very little before their mating ritual occurs. (Approx. 0.8-1.0 inches) Aquatic sow bugs are most often found in streams but are sometimes seen in ponds and lakes. 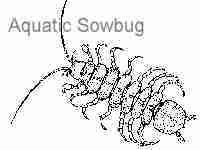 Although they aren't good swimmers like the scuds, aquatic owbugs eat dead and decaying matter like scuds do. Adult, 0.9 inches; Larvae, 1.0 inches) Horsefly larvae are stout and look like worms with tapered ends. The larvae, which live in the water, feed on snails, worms, and other small animals. (Adult, 1.0-2.5 inches; Larvae, 0.8-1.0 inches) Mayfly larvae typically feed on live or decaying plants, including leaves and algae from plant stems. While mayfly nymphs live for about a year, the adults lives three days or less – just enough time to mate and lay eggs. The nymphs have 7 pairs of gills along the abdomen and they have 3 (sometimes 2) feathery tails. Adult mayflies hve four wings which are almost transparent. (Adult, up to 3 inches) Giant Water Bugs are the largest of true bugs and can eat an animal fifty times bigger than itself! Large adult Water Bugs will ambush other insects, tadpoles, crustaceans, and even frogs. They kill their prey with poison secreted when they bite. (Adult, 0.2-0.3 inches; Larvae, 0.2-0.5 inches) Mosquitoes are often found in ponds, swamps, marshes, and lakes. Mosquito larvae often rest on the water surface with their breathing tubes open to the air. Larvae eat microscopic animals, algae, and debris, using mouth brushes to filter their food. As adults, only females bite to get a meal of blood while males usually eat nectar and ripe fruit. (Adult, approx. 0.8 inches) Water Strider (Pond Skater) are thin, brownish-black bugs with long legs which spend most of their lives watching for and eating dead or drowning insects which get trapped on the water surface. (Adult, approx. 1.0 inches) Water Boatman are slender insects with long hind legs suited for swimming. The Water Boatman will hold onto a plant stem or other object to stay under water. It gets air from the surface which usually surrounds the bug in a silvery bubble. Water Boatmen eat plant and animal remains sucked from the bottom ooze. They will also eat algae and plant fluids. (Adult, 0.5 inches, larvae, approx. 0.8-1.0 inches) Whirligig Beetle larvae crawl along the bottom of plants. Adults are shiny, bluish-black beetles that live on the water surface and are known for their antics as they skim the water's surface and dive underwater. The adults sometimes protect themselves by emitting a foul odor which fends off predators. They also have eyes split so they can see above and below the water surface. The larvae are carnivores while the adults eat dead plants and animals. (Adult, 0.2 inches; larvae inches) Most midge larva feed on smaller larvae, microorganisms, and decaying matter. Midges are an important link in food webs, providing nourishment for many fish. The larvae of true midges usually have a red color to them and are called bloodworms; they will eat fragments of plants floating on the water and small clam shrimp. Most midges are harmless to humans but the "no-see-ums" are known for their biting. Depending on the species, midges can be predators, herbivores, or omnivores. They tend to be more tolerant of pollution. (Approx. 1.5 inches) Red-tailed Maggot (Drone Fly Larvae) The larvae of the drone flies (or hover flies) are called red-tailed maggots and tend to be tolerant of polluted waters. Red-tailed maggots usually live at the bottom of shallow waters. They have a long tail that draws oxygen from the air. (Adult, 2.7 inches; Larvae, up to 3.0 inches) Hellgrammite larvae can live 2-3 years in the water and are a preferred bait for fishing. The larvae will later emerge on land as adults that only live a few days. Hellgrammites eat other living things, mostly insects, using its large jaws. Hellgrammites absorb oxygen through gills on the sides of their abdomen or through the surface of their bodies. An adult male dobsonfly is quite a sight with its 1-inch curved mandibles. (Adult size, 1 inch; larval size, about 1.1 inch) Predaceous Diving Beetle larvae are long, thin and have a small head. The adults are shiny, brownish-black in color and are good fliers. Both the adults and larvae are known to eat small fish, tadpoles, other insects and small animals. (Adult, approx. 2.5 inches) Although Water Scorpions walk slowly, they can ambush prey (mostly insects) with a quick strike of their forelegs. They live underwater but get air using a clever "snorkel." This breathing tube is formed when water scorpions hold their two rear appendages together and push them through the water surface.